Before learning about haeng-ma in detail, we should know about attributes of stones. Simply put, they can be classified into two categories. But most basic factors are the number of liberties and their location on the board. All other things being equal, more liberties for stones means a greater stability (strength) for stones. We can simply regard the liberties of stones as "their roads of breathing." In fact, "road of breathing" is one of the meanings of the go term "liberty" in Korea. As the liberties of a stone are getting reduced it will suffer from a lack of oxygen (metaphorically speaking) and will eventually die. 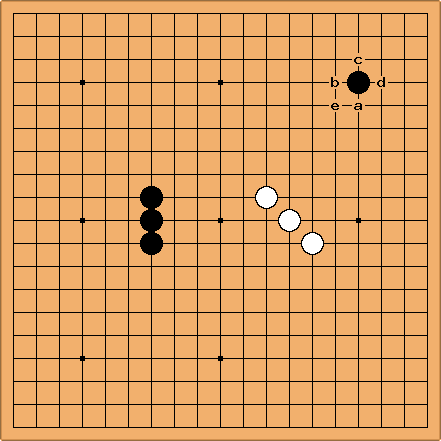 In this diagram, three black stones (a, b, and c) have four liberties while one black stone (stone d) at the right edge has only three. So, considering the number of liberties, Black's stones from a to c have more stability than d (which is feeling uneasy now because it has fewer liberties). This is another important factor that affects the degree of stability (strength) of your stones. If your stones had infinite liberties they would get unconditional life; but, the Go board is finite, and so we cannot make infinite liberties for our stones. Another way to make unconditional life is making two eyes. As you probably know, in the corner it's easier to make eyes (in other words, a base) than in the sides or center. It is probably easy to see intuitively why this is so. I added some stones in lower left area to help show this. So, assuming all else is equal, stones in the corner are best at stability, then stones at the side, and last stones in the center. Considering what we have seen in this diagram (diagram 1-1), black b is the most stable stone (this stone has its maximum liberties, located in corner), black c is a bit weaker than black b (c's position is a little higher, and closer to the center, so a bit harder to give it a base than black b). The stone at tengen, a, is third, and the stone in the worst position is d.
For convenience, regard stones on the board as living things (cells, bacteria, or whatever you want). Each stone has its own life, and each wants to make as many copies of itself as possible, spreading over whole board. The degree of stability (power, or strength) can be different for each stone. Some might be very healthy, having enough liberties (roads of breathing), a comfortable base (plenty of eyes), or many friendly stones around them. These are strong stones. But others might be weaker due to lack of liberties or lack of eye shapes (no base). The point is very simple. All stones want to develop over the whole board, and grow bigger and bigger. In other words, they want to make as many copies (stones of the same color) as quickly as possible on the board. If they can grow and grow (develop) on the board in an efficient and healthy way then they will get solid control of the board, and this result will come up "in the form of secured territories." Now, let's see what this single stone at hoshi wants to do in the diagram. This stone has four directions to develop. From a to d. Why not e? Of course, that can be a direction to develop, too. But, in Go, all stones want to develop (grow, flow) along straight lines if possible. When they are aligned in straight lines, they are stronger and more powerful than stones aligned in diagonal lines. In ordinary go terms, stones that makes straight lines are said to be thicker than diagonal lines. This is a very fundamental and important principle in haeng-ma, so I will provide more specific explanations and examples about this principle over and over again in later chapters. In this diagram, the 3 black stones in the center have a stronger and more powerful position than the 3 white stones. In other words, the position of black is thicker than the position of white. 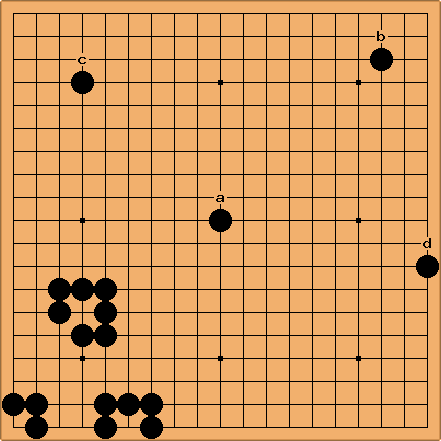 So, if we consider just the thickness of stones, black's position is "much better", thicker, than white's. Correspondingly, the three white stones are a bit thin.